The Golden Age of Averroism. Averroes, like his contemporary Maimonides, was a strict Peripatetic; yet they differed greatly in matters of faith. While Maimonides, with all his admiration for Aristotle, dared to contradict his theories, or at least sought to attenuate them when they were in direct opposition to religion, Averroes indorsed them to their utmost extent, and seemed even to take pleasure in emphasizing them. "God," says Averroes, "has declared a truth for all men that requires for understanding no intellectual superiority; in a language that can be interpreted by every human soul according to its capability and temper. The expositors of religious metaphysics are therefore the enemies of true religion, because they made it a matter of syllogism" (J. Müller, "Philosophie und Theologie," including the Arabic text, pp. 104 et seq.). In expounding what he thought to be the doctrines of Aristotle, it made no difference to Averroes whether they were or were not in harmony with those taught by the Koran. Thus Averroes asserts again and again the eternity of the universe; although, as Maimonides demonstrated in his "Guide" (ii. 28, 121-127), Aristotle himself is not very decisive on this point. Averroes goes still further and declares that not only is matter eternal, but that form even is potentially existent, otherwise there would be creation ex nihilo ("De Cœlo et Mundo," p. 197). Maimonides advocates man's absolute free-will, but Averroes restricted that freedom. "Our soul," says the latter, "can have preferences indeed, but its acts are limited by the fatality of exterior circumstances; for if its deeds were the production of its will alone, they would be a creation independent of the first cause, or God" (Joseph Müller, ib. Arabic text, p. 110). Maimonides, like Avicenna, places the existence of all creatures in the category of the possible; that of God, in that of the necessary("Moreh," ii., Introduction, propositions 19 and 20). Averroes combats Avicenna's classification for the simple reason that, every being having a cause, its existence is necessary ("Destructio Destructionis" at the end of the "Disputatio," x.). However, it was due to Maimonides that the philosophy of Averroes found admirers during four centuries among the Jews, who by their translations and commentaries preserved his writings from destruction and transmitted them to the Christian world. But if Averroes owed the preservation of his writings to the Jews, Jewish literature, in its turn, is indebted to him, directly and indirectly, for many valuable contributions. In addition to the translations of Averroes' works and commentaries on them —which in themselves form a fairly large library—the thirteenth, fourteenth, and sixteenth centuries witnessed the production of numerous essays and treatises inspired by Averroism. The first to introduce his philosophy to Jewish literature was Samuel ibn Tibbon, the same who translated Maimonides' "Moreh." Tibbon published, at the beginning of the thirteenth century, an "Encyclopedia of Philosophy," which frequently is nothing but literal extracts from Averroes, whom the author declares to be the most reliable interpreter of Aristotle. A little later, 1232, appeared the first real translation, by Jacob ben Abba Mari Anatoli, a son-in-law of Ibn Tibbon. He was a Provençal, living in Naples, and engaged by Frederick II. to popularize Arabian science. In 1260, Moses ibn Tibbon translated nearly the whole of the Short Commentary. About the same time, Solomon ben Joseph ben Job, originally from Granada, but living in Beziers, translated of the Short Commentary that on Aristotle's treatise, "De Cœlo et Mundo," under the title of . In 1284, Zeraḥia ben Isaac of Barcelona translated of the Middle Commentaries that on Aristotle's "Physics," as well as Averroes' treatises, "De Cœlo et Mundo" and "Metaphysics." The same Anatoli translated in 1298 Averroes' "Abridgment of Logic," under the title of ; and in 1300, under the title of , the commentaries upon books xi.-xix. of the "History of Animals." Other writers of this century that expounded Averroes were Judah ben Solomon Cohen of Toledo, author of "Peripatetic Encyclopedia," 1247; and Shem-Ṭob ben Joseph b. Falaquera (1224-95), who inserts lengthy extracts from Averroes in his books, the "Moreh ha-Moreh," "Hanhagat ha-Guf weha-Nefesh," and the "Sefer Hama'alot." The study of Averroism was so wide-spread that, not content with the foregoing translations, the firsthalf of the fourteenth century produced a new series. Kalonymus b. Kalonymus, son of Meïr of Arles (1277-1330), translated, in 1314, under the following titles, the Grand Commentaries on the "Organon" ( ), the "Physics" ( ), the "Metaphysics" ( ), and the treatises "De Cœlo et Mundo," "Generation and Corruption," "Meteors," "The Soul," and "The Letter on Union," etc. R. Samuel b. Judah b. Meshullam of Marseilles translated the Short Commentary on the "Nikomachean Ethics," under the title , and the paraphrase of Plato's "Republic," under the title of . Todros Todrosi of Arles translated in 1337, under the following titles, the commentaries on the "Topics" ( ), the "Sophisms" ( ), the "Rhetoric" ( ), and "Poetics" ( ). In addition to these a crowd of other translators of uncertain date likewise devoted themselves to the study of the works of Averroes. Shem-Ṭob Isaac of Tortosa translated the commentary on the "Physics," and the treatise on the "Soul"; Jacob b. Shem-Ṭob, the "First Analytics"; Judah ben Taḥin Maimon, the "Physics," the treatises on "Heaven" and on "Generation"; Moses ben Tahora b. Samuel b. Shudai the treatise on "Heaven"; Moses b. Solomon of Salon, the "Metaphysics"; Judah b. Jacob, books xi.-xix. on "Animals"; Solomon b. Moses Alguari, the treatise "De Somno et Vigilia." The second half of the fourteenth century is the golden age of Averroism among the Jews. There were no more translations, but scholars innumerable vied with one another in commenting on the commentaries and applying the teachings of those commentaries to theology. 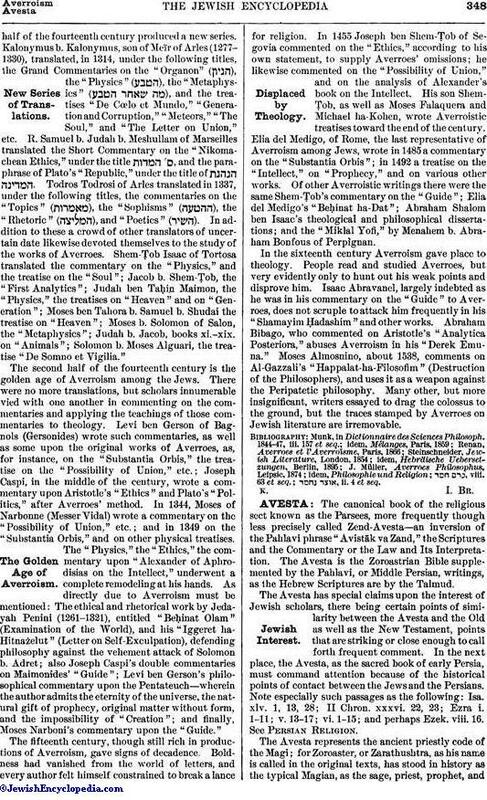 Levi ben Gerson of Bagnols (Gersonides) wrote such commentaries, as well as some upon the original works of Averroes, as, for instance, on the "Substantia Orbis," the treatise on the "Possibility of Union," etc. ; Joseph Caspi, in the middle of the century, wrote a commentary upon Aristotle's "Ethics" and Plato's "Politics," after Averroes' method. In 1344, Moses of Narbonne (Messer Vidal) wrote a commentary on the "Possibility of Union," etc. ; and in 1349 on the "Substantia Orbis," and on other physical treatises. The "Physics," the "Ethics," the commentary upon "Alexander of Aphrodisias on the Intellect," underwent a complete remodeling at his hands. As directly due to Averroism must be mentioned: The ethical and rhetorical work by Jedayah Penini (1261-1321), entitled "Beḥinat Olam" (Examination of the World), and his "Iggeret ha-Hitnaẓelut" (Letter on Self-Exculpation), defending philosophy against the vehement attack of Solomon b. Adret; also Joseph Caspi's double commentaries on Maimonides' "Guide"; Levi ben Gerson's philosophical commentary upon the Pentateuch—wherein the author admits the eternity of the universe, the natural gift of prophecy, original matter without form, and the impossibility of "Creation"; and finally, Moses Narboni's commentary upon the "Guide." The fifteenth century, though still rich in productions of Averroism, gave signs of decadence. Boldness had vanished from the world of letters, and every author felt himself constrained to break a lance for religion. In 1455 Joseph ben Shem-Ṭob of Segovia commented on the "Ethics," according to his own statement, to supply Averroes' omissions; he likewise commented on the "Possibility of Union," and on the analysis of Alexander's book on the Intellect. His son Shem-Ṭob, as well as Moses Falaquera and Michael ha-Kohen, wrote Averroistic treatises toward the end of the century. Elia del Medigo, of Rome, the last representative of Averroism among Jews, wrote in 1485 a commentary on the "Substantia Orbis"; in 1492 a treatise on the "Intellect," on "Prophecy," and on various other works. 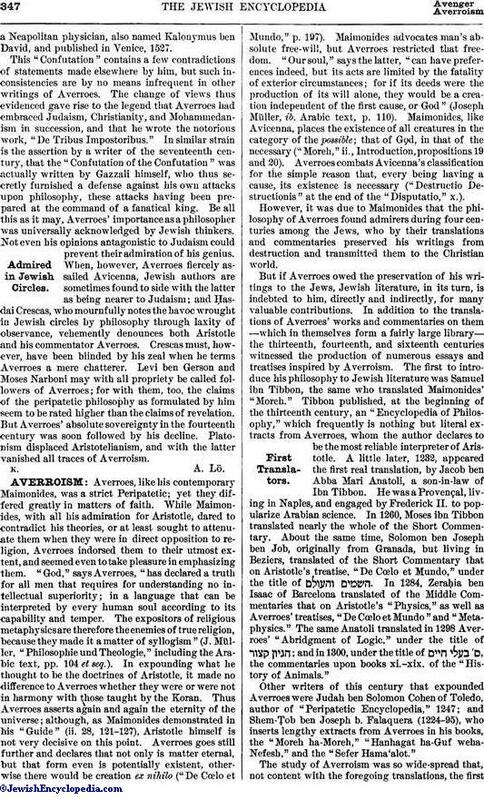 Of other Averroistic writings there were the same Shem-Ṭob's commentary on the "Guide"; Elia del Medigo's "Beḥinat ha-Dat"; Abraham Shalom ben Isaac's theological and philosophical dissertations; and the "Miklal Yofi," by Menahem b. Abraham Bonfous of Perpignan. In the sixteenth century Averroism gave place to theology. People read and studied Averroes, but very evidently only to hunt out his weak points and disprove him. Isaac Abravanel, largely indebted as he was in his commentary on the "Guide" to Averroes, does not scruple to attack him frequently in his "Shamayim Ḥadashim" and other works. Abraham Bibago, who commented on Aristotle's "Analytica Posteriora," abuses Averroism in his "Derek Emuna." Moses Almosnino, about 1538, comments on Al-Gazzali's "Happalat-ha-Filosofim" (Destruction of the Philosophers), and uses it as a weapon against the Peripatetic philosophy. Many other, but more insignificant, writers essayed to drag the colossus to the ground, but the traces stamped by Averroes on Jewish literature are irremovable. , ii. 4 et seq.